Be the first to share your favorite memory, photo or story of Marjorie. This memorial page is dedicated for family, friends and future generations to celebrate the life of their loved one. 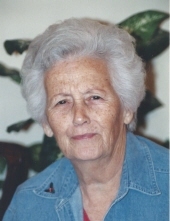 Marjorie Tucker, 85, of Pelham passed away, Friday, April 5, 2019 at Pelham Parkway Nursing Home. Funeral services will be 11:00 a.m., Monday, April 8, 2019 at Southside Baptist Church in Camilla with interment at Union Grove Baptist Church Cemetery with Rev. Steve Wooten and Rev. Doug Hall officiating. Serving as pallbearers will be Danny Burgess, Gerald Brooks, Chuck Turner, Tab Ritter, Dewayne Bentley and Donald Hayes. Honorary pallbearers will be nephews of the Tucker and Burgess families. Born October 9, 1933 in Mitchell County, she was the daughter of the late Henry B. Burgess and JanieBell Williamson Burgess. She worked with Coats and Clark for 44 years. Mrs. Tucker was preceded in death by her husband, Madison Jr. Tucker; daughter, Sandra Bullins; son, Mark Tucker; sisters, Cleo Griffin, Trudy Pollock, Evelyn Croft; brothers, Ish Burgess, Ed Burgess, Russell Burgess, Billy Burgess, Wallace Burgess, Everett Burgess, and Ray Burgess. Survivors include a son, Marcus Tucker of Pelham; daughters, Jan (Shane) Pollock of Pelham, Meg (Mike) Latham of Pelham, Marty (Matt ) Green of Pelham, Debra Gardner of Jacksonville, Barbara Wren of Jacksonville and Bonnie Martin of Jacksonville; sisters, Annette Turner of Pelham, Dorothy Peterson of Pelham, LaGail (Wayne) Brooks of Pelham, Judy Radney of Pelham, Sue (Hollis) Ritter of Abbeville, AL, Janie Peacock of Moultrie; brother, Tom (Stacey) Burgess of Camilla, 18 grandchildren, 13 great-grandchildren and 2 great-great-grandchildren and special caregiver for 7 years, Temeka Vicks of Pelham. Visitation will be 6:00 – 8:00 p.m., Sunday, April 7 at Parker-Bramlett Funeral Home. Memorials may be made to Union Grove Baptist Church, 2293 Old Pelham Road, Pelham, Ga. 31779 or the Alzheimer’s Association, South Georgia Region, 225 E. Second Street, Tifton, Ga. 31794. To sign the online guest registry, visit our website at www.parkerbramlett.com. "Email Address" would like to share the life celebration of Marjorie Burgess Tucker. Click on the "link" to go to share a favorite memory or leave a condolence message for the family.